We’d love your help. 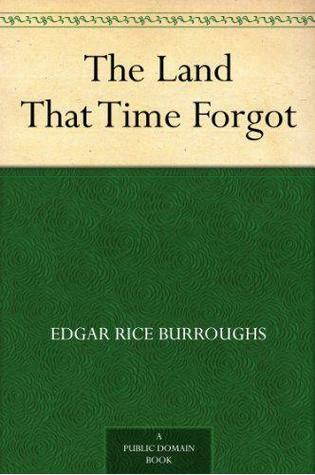 Let us know what’s wrong with this preview of The Land That Time Forgot by Edgar Rice Burroughs. In the South Pacific is a mountainous island called Caspak. Winged humanoid creatures, dinosaurs, ferocious beasts of prey, Neanderthals, "wild ape-men," and monstrous reptiles terrorize each other, and the mixed crew of WW 1 adventurers who fight across the island and dine on Plesiosaurus steaks in the company of a jungle princess. To ask other readers questions about The Land That Time Forgot, please sign up. A pulpy adventure at its best. A nameless guy found a thermos with a manuscript inside. The manuscript is the story. It began during the World War I when a young American was on a boat that was torpedoed by a German submarine. Thus began his naval adventure which quite unexpectedly (for those who did not know) became the adventure in the Lost World à la Sir Arthur Conan Doyle or Sir H. Rider Haggard. There is some romance too. Look up Pulp Fiction in a dictionary. I am sure the name of Edgar Ric A pulpy adventure at its best. A nameless guy found a thermos with a manuscript inside. The manuscript is the story. It began during the World War I when a young American was on a boat that was torpedoed by a German submarine. 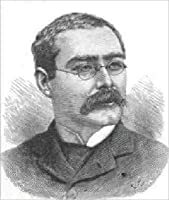 Thus began his naval adventure which quite unexpectedly (for those who did not know) became the adventure in the Lost World à la Sir Arthur Conan Doyle or Sir H. Rider Haggard. There is some romance too. Look up Pulp Fiction in a dictionary. I am sure the name of Edgar Rice Burroughs would show up in the beginning. The guy wrote pulp considered to be classic these days. Cheesy? Yes. The main hero is way too perfect? You bet. Fun easy to read adventure? YES, one thousand times yes. Again I need to mention something I keep saying in my reviews. I already said that the book consists of great naval adventure and equally great lost world adventure. Can you guess the total number of pages? My edition (from Project Gutenberg) has 90 pages. The author was able to tell two interconnected stories in this tiny amount of pages. Yes, there were some great descriptions of surroundings as well. So how did ha manage it? Burroughs never bothered to describe the dishes the adventures ate, only the way they got the food on the table so to speak. He never bothered to describe the colors of loincloths of local population and nether their fashions - what a radical idea!!! 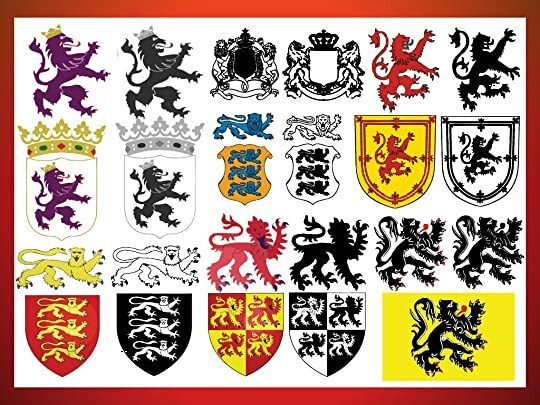 He never described any heraldry - but in this case the justification was that there were none. Cut off this stuff from modern books and you have already reduced their length by about half. ✘✘ Sarah ✘✘ (former Nefarious Breeder of Murderous Crustaceans) Evgeny wrote: "This is my part-time job actually." The pay is crap so I'm surprised you still haven't quit. Evgeny ✘✘ Sarah ✘✘ (former Nefarious Breeder of Murderous Crustaceans) wrote: "Evgeny wrote: "This is my part-time job actually." The pay is crap so I'm surpr ✘✘ Sarah ✘✘ (former Nefarious Breeder of Murderous Crustaceans) wrote: "Evgeny wrote: "This is my part-time job actually." The pay is crap so I'm surprised you still haven't quit." The Land that Time Forgot is a fantasy novel, based on the similar lines of The Lost World, in which a group of people find themselves in a strange land, that was cut off from the rest of the world since antiquity, where they find flora and fauna of prehistoric ages still surviving (and yes, that includes Dinosaurs and other wild creepy creatures). How they came to be in this wild prehistoric land is actually another adventure, and a different story in itself, which only make it more realistic and appealing. It was a gripping novel: if started once, you can't keep it down: it moves with descent pace with many twists and turns, and most importantly: it has been written quite judiciously. Burroughs is a very good story-teller: he creates an atmosphere filled with uncertainty and unease, quite effortlessly, and also succeeds in depicting the situation where people are stuck in a grim and dangerous environment that is thousands of miles away from the nearest civilization. It's not only a story of an adventure to an unknown land but also of love, betrayal, courage, and above all: hope and survival. In 1916, an American civilian ship is attacked and sunk by a German U-boat. Some of the survivors and their saviors subsequently get stranded on a strange island; an island that no modern human has set foot upon or even knows about (presumably). Thus, this thrown-together group tries to survive amidst various dinosaurs, Neanderthals, „ape-men“ and other dangers. Sound familiar? Yeah. This must be the original story that spawned The Lost World as much as movies such as Jurassic Park and all their s In 1916, an American civilian ship is attacked and sunk by a German U-boat. Some of the survivors and their saviors subsequently get stranded on a strange island; an island that no modern human has set foot upon or even knows about (presumably). Sound familiar? Yeah. This must be the original story that spawned The Lost World as much as movies such as Jurassic Park and all their sequels. There are quite a lot of war-time scenes (the sinking of the boat, being rescued, being captured etc) before we finally get to the island but considering when this story takes place and how the group came together, that was quite realistic. 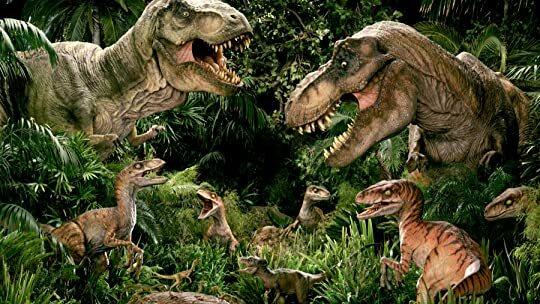 I’m not entirely happy that some of the very first dinosaurs they encountered ended up as dinner but they were starving so I understand. The story then veers towards (view spoiler)[a typical fight between modern humans vs primal homo versions incl. corresponding behaviorisms (hide spoiler)] that might not be to everyone’s taste but I didn’t read too much into it. In fact, I thought that this author managed be much more modern in how he treated certain topics than numerous authors from later decades (as late as the 70s and 80s). As a kid, I didn’t play with plush ponies but with dinosaurs crafted from durable rubber. 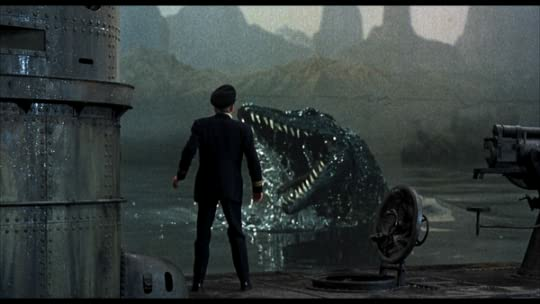 I loved any kind of movie that had giant and strange animals so, naturally, I loved the stories by Jules Verne or this author. 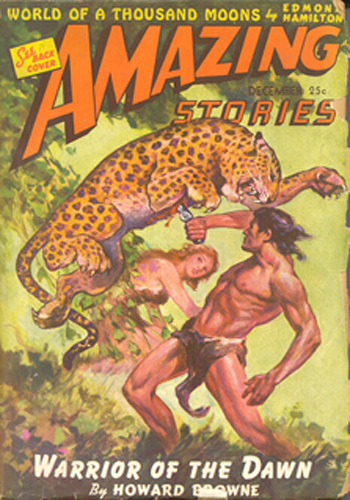 Though at the time I didn’t know about Edgar Rice Burroughs as such. I just loved seeing humans in remote places on Earth, walking among giant extinct animals, trying to survive the hostile environment and marveling at what Earth must have looked like a few million years ago. The author’s writing style is quite engaging, the short story fast-paced and engaging. The characters aren’t the best I’ve followed through the pages but nevertheless well-drawn. The highlight, however, are of course the creatures living on the island out of time. Marvelling at a world that might be fantasy but, at one point in time, had also been real (more or less). There aren't as many mentioned here as shown in the movie from which the pictures / gifs are taken but one can easily imagine the island's ecosystem. As Libervox recordings go, this one is pretty good. The reader, Snelson, has a voice that goes with the story pretty well, although his accents for some characters are just awful. Still, I wanted to read this book with a group & didn't have time for the old paperback on my shelves. The library has an audio edition, but it's out on loan & I'm still waiting for it. (I know why electronic formats are limited in their number of loans, but I don't like it.) This edition was handy & the bo As Libervox recordings go, this one is pretty good. The reader, Snelson, has a voice that goes with the story pretty well, although his accents for some characters are just awful. Still, I wanted to read this book with a group & didn't have time for the old paperback on my shelves. The library has an audio edition, but it's out on loan & I'm still waiting for it. (I know why electronic formats are limited in their number of loans, but I don't like it.) This edition was handy & the book is short, not even 4 hours long. Okay but not great, and pales in comparison to Arthur Conan Doyle's The Lost World, (which was written six years earlier, and to which this clearly owes a debt if not an outright apology). Not really sure what Burroughs' focus was here; the first half of the book is exclusively a World War I submarine story, and only does the second half take place in his nonsensical lost continent. Unlike Doyle, who at least stabbed at scientific plausibility atop his isolated South American tepuis, Burroughs b Okay but not great, and pales in comparison to Arthur Conan Doyle's The Lost World, (which was written six years earlier, and to which this clearly owes a debt if not an outright apology). Not really sure what Burroughs' focus was here; the first half of the book is exclusively a World War I submarine story, and only does the second half take place in his nonsensical lost continent. Unlike Doyle, who at least stabbed at scientific plausibility atop his isolated South American tepuis, Burroughs barely tries to have his science make sense - an entire semi-tropical continent lost just north of Antarctica; dinosaurs, modern mammals and at least 5 (?) species of "cavemen" co-evolving/co-existing; etc. Really? And while there are more dinosaurs and other beasts here than in Lost World, they really play no part in the story - they're just kind of there in the background, and so except for one "Bosche" sailor eaten by a plesiosaur, could just as easily have been feral cats or noisy neighbors for all the impact they have. In terms of writing, Burroughs' protagonist is a pretty colorless character. I understand this is often the case with first person narrators (which Lost World also had), especially back in the self-effacing early 1900's. But Burroughs doesn't offer us any secondary, larger-than-life or even just interesting characters like Professor Challenger to hold out interest. I did not realize that this was the first book in a trilogy. But it's the only one available at our library, and it didn't hold me enough to look elsewhere for the sequels; will just read the Wikipedia pages to see what happened next. Similar to Arthur Conan Doyles's The Lost World, but with a touch of romance added. Entertaining, but not as good as his A Princess of Mars. I have yet to read his Tarzan novels. In 1995, I sold a large box full of mint-condition Edgar Rice Burroughs books left over from my younger days. A coworker took it off my hands for the princely sum of $10. Looking at what's available today on eBay (where I retrieved a new copy of this title), that box might now fetch $500. Oops. My recollection of Burroughs is that (possibly aside from the Tarzan series) he had a formula, which he used again and again: a doughty hero ventures into extraordinary circumstances, and along the way res In 1995, I sold a large box full of mint-condition Edgar Rice Burroughs books left over from my younger days. A coworker took it off my hands for the princely sum of $10. Looking at what's available today on eBay (where I retrieved a new copy of this title), that box might now fetch $500. Oops. My recollection of Burroughs is that (possibly aside from the Tarzan series) he had a formula, which he used again and again: a doughty hero ventures into extraordinary circumstances, and along the way rescues and falls in love with a beautiful and resilient woman. Well, when I avidly read and reread everything of Burroughs that was in print in the early 60s, I thought that formula worked just fine. And reading it now -- heck, it still works. Sometimes the prose feels a little purple. Sometimes I could wish for a little more introspection. But I think Burroughs might be underrated. It's startling how clear my memory of this tale is as I read it again. I feel almost as if I'm revisiting my boyhood home. This short book was first published in 1918. Worts and all, this book is considered a classic. A group of people are stranded on an island with dinosaurs. To enjoy this book, you must suspend your knowledge of science and evolution. The book may be the source, or, at least, evidence of the beginning of the false idea that humans were the "goal" of evolution, and that some creatures are "more evolved" than others. Also, when homo sapiens were "more evolved" Burroughs describes them as being "less This short book was first published in 1918. Worts and all, this book is considered a classic. A group of people are stranded on an island with dinosaurs. To enjoy this book, you must suspend your knowledge of science and evolution. The book may be the source, or, at least, evidence of the beginning of the false idea that humans were the "goal" of evolution, and that some creatures are "more evolved" than others. Also, when homo sapiens were "more evolved" Burroughs describes them as being "less negroid" (oh brother). There are creatures from different Eras. Burroughs freely mixes Cenozoic and Mesozoic era fauna and flora, not that I'm an expert in such, but this is now common knowledge that humans and triceratops did not co-exist. Also, the sexism in this book is so over the top you'll shake your head and, hopefully, be grateful for better times. I enjoyed this (nearly) 100 year old classic adventure. I loved this book. It's like a mix between Indiana Jones, Gulliver's Travels, Jurassic Park and a mutant sort of Planet of the Apes, with some other stuff thrown in. I don't know that I've seen either of the movies (maybe parts of the first one, when I was a kid), but I recommend reading it first, as it is significantly different, from what I've read about the movies on Wikipedia. The book is rather short (only about 40k words, which is 10k words off being a long short story). The writing style is I loved this book. It's like a mix between Indiana Jones, Gulliver's Travels, Jurassic Park and a mutant sort of Planet of the Apes, with some other stuff thrown in. The writing style is definitely fast-paced and extremely easy to read/follow. It's quite enjoyable, although it's more of an action style mixed with a journal than something very descriptive or full of obvious literary devices. The book ends well, but there are some things left unresolved: that's probably what the next two books are for: to tell us how these evolving people work, and maybe about those tadpole pools the native women used. There is at least one thing that might not seem realistic, though: i.e. how the main character seems to have so much ammunition (without an explanation). It takes half the book before they get to the island, but the first half is certainly interesting, too—submarine wars between them and the Germans, basically, and intrigue with prisoners, and the woman, Lys. This book was written in 1918 and takes place during World War I. We have a u-boat lost at sea that stumbles across an island that is secluded and untouched by mankind and all environmental and evolutionary changes that have taken place over the past millions of years so our heroes are stuck on an island with dinosaurs, saber tooth tigers, primitive man and all kinds of other monsters. This was not the first time I've read this novel but I didn't remember how slow it was at the start. It took almo This book was written in 1918 and takes place during World War I. This was not the first time I've read this novel but I didn't remember how slow it was at the start. It took almost a third of the way into the book before they ever reach the island. Good action. Good characters (although dated). So how to rate the book? For historical relevance (I can't even begin to count the number of movies, comics and books that were spun off the ideas in this novel) this is a 5+ star book. So I'll average it out to 4 stars. Half submarine adventure story, half unbelievable lost island adventure, all pulp. Probably draws a lot from Sir Arthur Conan Doyle's The Lost World, published four years earlier and given much more acclaim. Both were originally published in magazines. Judging it as pulp, the rough plot works and is plenty exciting. The tropical "island" is too unbelievable, with 3 or 4 species of early man in addition to scattered dinosaurs, and all just north of Antarctica. Worse, the dinosaurs aren't the menac Half submarine adventure story, half unbelievable lost island adventure, all pulp. Probably draws a lot from Sir Arthur Conan Doyle's The Lost World, published four years earlier and given much more acclaim. Both were originally published in magazines. Judging it as pulp, the rough plot works and is plenty exciting. The tropical "island" is too unbelievable, with 3 or 4 species of early man in addition to scattered dinosaurs, and all just north of Antarctica. Worse, the dinosaurs aren't the menacing villains we would expect, and play a very minor part of the plot. Perhaps early man (and his voyage "north") is meant to be a metaphor here? The jujitsu wielding main character works well, and his paramour is quite capable - perhaps more so than most of the time. I enjoyed this book like I have enjoyed many ERB books. His classic style of writing is always pleasant and the adventure for our characters in this one is not short on entertainment value. While not quite as wild as his Barsoom escapades, ERB takes readers on a very satisfying adventure into a lost world of long forgotten creatures and peril. When I was 12 I happened to read the third book in the series, OUT OF TIME'S ABYSS. This was long before Amazon, Kindle, and the internet, so I was never able to find the first two books, THE LAND THAT TIME FORGOT and THE PEOPLE THAT TIME FORGOT. This is the first book in the series, and it was very, very slow for at least the first half of the book. That's because Burroughs has to explain how a bunch of cowboys, merchant seamen, etc. 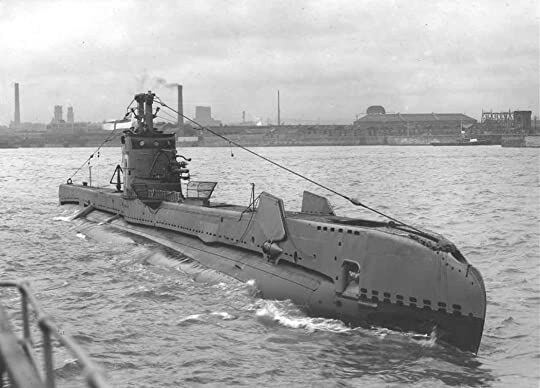 happen to get hold of a state of the art German U-Boat at the When I was 12 I happened to read the third book in the series, OUT OF TIME'S ABYSS. This was long before Amazon, Kindle, and the internet, so I was never able to find the first two books, THE LAND THAT TIME FORGOT and THE PEOPLE THAT TIME FORGOT. This is the first book in the series, and it was very, very slow for at least the first half of the book. That's because Burroughs has to explain how a bunch of cowboys, merchant seamen, etc. happen to get hold of a state of the art German U-Boat at the height of World War One, and how they overpower the German crew, and how they all end up (with the Germans) on a mysterious continent near Antarctica called Caprona, which is surrounded by huge cliffs and contains a lost tropical world full of dinosaurs and cavemen. I can't say I didn't enjoy this book, but it really is pure crap. Robert E. Howard and H.P. Lovecraft are Hemingway and Faulkner compared to this guy. Yet when he was alive I think he outsold both of them put together ten times over. What does that tell you? Now I'm going to read THE PEOPLE THAT TIME FORGOT. The Land That Time Forgot greatly resembles Doyle's Lost World, in concept, but the execution differs in the details. As much as I enjoyed the story, and love all of ERB's books, it's not for the writing itself that I read him. Even his characters are often a bit one sided and stereotyped. What is most captivating about Burrough's is his creation of worlds and stories, and even his flawed psychology. Regardless of writing style, nobody's doing quality checks on good escapist novels anyways. As ERB put it in the novel, "Metaphor, no matter how poetic, never slaked a dry throat." So, he restrains himself from the drama and gets on with the business of shooting dinosaurs and building forts, and of course encountering Neanderthals. And, that is all it takes to hold modern man's attention for the evening it takes to read this short work, while microwaving a quick meal. This is the first book of Edgar Rice Burroughs I have read. It's a novella that starts off as a rollicking adventure on the high seas during World War I. The main character whose name we don't know until near the end is travelling with his dog on an American cruise ship. When it's torpedoed by a German submarine, he's catapulted into a series of events that lead him to a remote island in the Pacific Island. The title tells you what to expect. The island's inhabitants are creatures and vegetation This is the first book of Edgar Rice Burroughs I have read. It's a novella that starts off as a rollicking adventure on the high seas during World War I. The main character whose name we don't know until near the end is travelling with his dog on an American cruise ship. When it's torpedoed by a German submarine, he's catapulted into a series of events that lead him to a remote island in the Pacific Island. The title tells you what to expect. The island's inhabitants are creatures and vegetation that should have died thousands of years ago. Or maybe they have. You will have to read it yourself. The story, the first of a trilogy, travels quickly. It's ending is probably not what a modern-day reader expects but it's logical. Burroughs' writing style flows easily too, and you will find some words in it to challenge your dictionary, but its a sign of the early twentieth century - when people possessed greater vocabularies than most today. Despite this, it's easy enough to read this story which will have you holding on for dear life when you encounter the ravenous dinosaurs, murderous WWI Germans and cannibalistic Neanderthals. The book has a strong beginning, mixing a gripping WWI adventure with a land of dinosaurs story. It tells the tale of English and American sailors who take control of a German submarine. The two crews must work together to stop a saboteur who is intent on destroying them all. The adventure then moves to the mysterious land of Caspak where they encounter "the land that time forgot." It is a world inhabited by dinosaurs, primitive men and constant danger. The author has a great descriptive style. The book has a strong beginning, mixing a gripping WWI adventure with a land of dinosaurs story. It tells the tale of English and American sailors who take control of a German submarine. The two crews must work together to stop a saboteur who is intent on destroying them all. The adventure then moves to the mysterious land of Caspak where they encounter "the land that time forgot." It is a world inhabited by dinosaurs, primitive men and constant danger. This is a pretty fun adventure book that starts as a war adventure that ends up on a prehistoric island. Since I was expecting dinosaurs from the get-go, that made it a little weird. The book picks up when they get to the island and they start battling dinos. Then they discover primitive peoples. The main character meets tribes one by one of various primitive man, each one progressive more advanced than the last. You can see how racism is subtly weaved into evolutionary ideas. The primitive peopl This is a pretty fun adventure book that starts as a war adventure that ends up on a prehistoric island. Since I was expecting dinosaurs from the get-go, that made it a little weird. You can see how racism is subtly weaved into evolutionary ideas. The primitive people are sometimes described like apes, and sometimes Negroid. On the other hand, there is some fun references to prehistoric men that have since been discovered to be hoaxes. It's been a good many years since I first read this one. I just watched the 1975 version, that starred Doug McClure, and wanted to compare the two. The script was co-written by Michael Moorcock and I thought it might be more literate than other such efforts. The ending was considerably different and a few incidents were compressed into one, one subplot eliminated, and cheesy looking dinos. The tale of a German U-boat, with the survivors of a merchant ship they'd sunk, land on an island tha It's been a good many years since I first read this one. 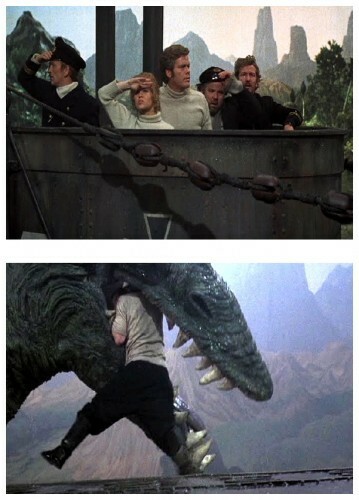 I just watched the 1975 version, that starred Doug McClure, and wanted to compare the two. The script was co-written by Michael Moorcock and I thought it might be more literate than other such efforts. The tale of a German U-boat, with the survivors of a merchant ship they'd sunk, land on an island that's a throwback, with different ages of evolution represented from dinosaurs to cavemen to animals alive today. Edgar Rice Burroughs was always an imaginative writer, even when his ideas tended to get a bit carried away. This one is a fun romp (with two sequels), though rather unevenly paced. His heroes (who he doesn't even name for about half of the book!) end up on a German U-Boat in World War I (a section that goes on and on) that stumbles across one of Burroughs' lost worlds. Just as the story starts to get interesting, it ends. On to book 2 tomorrow night! I liked the first half, but weirdly started to get pretty bored when they reached Caspak. I probably would have liked this as a boy, and boys are probably the intended audience. However, to me, the whole story felt too...silly. Not because of the dinosaurs and cavemen, but because of the awful narration from the protagonist Bowen Tyler, who divides his time between reflecting on his own strength and fighting skill and pining for Lys La Rue and admiring "the graceful curves of her slender body." It was a weird read. Fairly short and some odd sentence structures. I will be reading the other two books in the trilogy. If you want to read Burroughs though, stick to Mars or Tarzan. Fun little “lost world” story. Not the best of the genre, but still a good read. Caspak has cavemen and dinosaurs! It sometimes has WW1 Germans and weird speedy evolution, but I may have to read further for clarity. Yet another Burroughs series kicks off. This time it's with a message found in a bottle from Bowen J. Tyler Jr. Tyler went on a voyage on an ocean-liner with his dog, Nobs, only to be sunk by a German submarine and to later wind up taking over that submarine with the help of some British sailors and a female survivor destined to be the love interest. Unlike a lo Caspak has cavemen and dinosaurs! It sometimes has WW1 Germans and weird speedy evolution, but I may have to read further for clarity. Unlike a lot of Burroughs stuff, it actually takes the book a while to get to Caspak, or “The Land That Time Forgot”. About 40 pages are devoted to events at sea, including the power struggle aboard the submarine and mishap that forces them to eventually try to reach the inaccessible island. This also gives the book time to develop the romance, which proves to be the core of the book. In many senses, this book is designed more as the launch of a series than it is to be a contained adventure. The main concept, of an island where apes evolve into humans in their own lifetime, is kept a bit foggy even at the end. The usual patterns of capture and escape appear, as well as some of Burroughs' usual wilderness survival stuff. The odd part is that the book is segmented, almost as if it's two acts of three. There are early evidences of red-scare Burroughs here, since one particular villain confesses to being I.W.W. and that he hates Germany, but he hates America more. There's also some period scientific racism, but that's to be expected with older sci-fi much of the time. I've already seen the 1970s Amicus movies of both this and the sequel, “The People That Time Forgot”, with Doug McClure. No spoilers, but those actually have me looking forward to the second book. In 1916 upon the war-torn Atlantic ocean, an American named Santa Monica, his faithful pet Airedale Crown Prince Nobbler ('Nobs' for short) and assorted British fishermen do battle with the 'boche' for control of a German U-boat, then find themselves harried across the seas and led astray by a series of acts of sabotage to the navigating instruments. The crew remain in conflict until they find themselves without water but in sight of an unknown land mass in the southern hemisphere. The imaginary In 1916 upon the war-torn Atlantic ocean, an American named Santa Monica, his faithful pet Airedale Crown Prince Nobbler ('Nobs' for short) and assorted British fishermen do battle with the 'boche' for control of a German U-boat, then find themselves harried across the seas and led astray by a series of acts of sabotage to the navigating instruments. The crew remain in conflict until they find themselves without water but in sight of an unknown land mass in the southern hemisphere. The imaginary isle is Caprona, or Caspak to the natives, a place untouched by millions of years of evolution, inhabited by dinosaurs and early iterations of man, 'a veritable Mesozoic nightmare'. Beginning with the promise of 'glimpses of a world past, a world dead, a world so long dead', The Land That Time Forgot is a pulpy fantasy in the same vein as Conan Doyle's The Lost World. Unfortunately, an exciting premise is let down by highly functional plotting and writing, a typically adolescent love story, and the unremitting stupidity of the hero to a contemporary reader. I remember the Doug McClure film from the 1970s, which I enjoyed merely because I enjoyed all such movies when I was a child. I distinctly recall that it was amongst the least impressive of its kind, featuring inferior puppet dinosaurs instead of the stop-gap animation monsters you got when the incomparable Ray Harryheusen was involved.